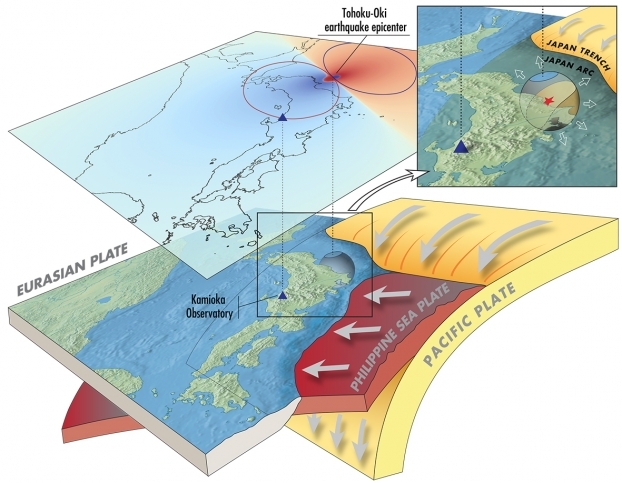 A modification of the earth’s gravitational field produced during a seismic rupture was first detected during the earthquake of Tohoku-Oki, which occurred on March 11, 2011 with magnitude 9.0. This work is the result of an international collaboration involving researchers from the Institut de Physique du Globe de Paris (IPGP, IPGP / CNRS / UPD / Reunion University) and the Astroparticle and Cosmology Laboratory (APC, CNRS / UPD / CEA / Observatoire de Paris / CNES), members of the UnivEarthS team E3 “Geophysics and gravitational wave interferometric detectors“. This new possibility of detecting a change in severity before the arrival of seismic waves could ultimately contribute to improving early warning systems for earthquakes. Transient gravity changes are expected to occur at all distances during an earthquake rupture, even before the arrival of seismic waves. Here we report on the search of such a prompt gravity signal in data recorded by a superconducting gravimeter and broadband seismometers during the 2011 Mw 9.0 Tohoku-Oki earthquake. During the earthquake rupture, a signal exceeding the background noise is observed with a statistical significance higher than 99% and an amplitude of a fraction of μGal, consistent in sign and order of magnitude with theoretical predictions from a first-order model. While prompt gravity signal detection with state-of-the-art gravimeters and seismometers is challenged by background seismic noise, its robust detection with gravity gradiometers under development could open new directions in earthquake seismology, and overcome fundamental limitations of current earthquake early-warning systems imposed by the propagation speed of seismic waves.